A Peña is a meeting of musicians; in Chile, especially, it means a popular venue where folk music is played and food and drink are freely available, and it was this sense we tried to recreate with our end-of-year gathering. We were treated to an impromptu performance by The Cleftomaniacs, and then the program proper opened with a bracket of moving songs of humanity and loss written by Violeta Parra, Hernan Flores and others, performed by Hernan Flores, Janis Carter and Ricky Vargas. Our own offerings included Fum! Fum! Fum!, a Catalan carol by Ernest Cervera; Javier Busto's Esta Tierra from the Basque country (yes, it's a firm favourite of ours, and once you hear it you'll know why); the wistful Memento by Mario Castelnuovo Tedesco; Cucu, cucu!, the 16th C cautionary tale about cuckolding by Juan del Enzina; Dadme albriçias, a joyous celebration of the Nativity from the Middle Ages; Adijo Kerida, an outspoken settling of emotional scores in the Ladino language from Sephardic Spain; and our very first test-flight with Bullerengue, a dance to celebrate young women's coming of age from Panama and Colombia. 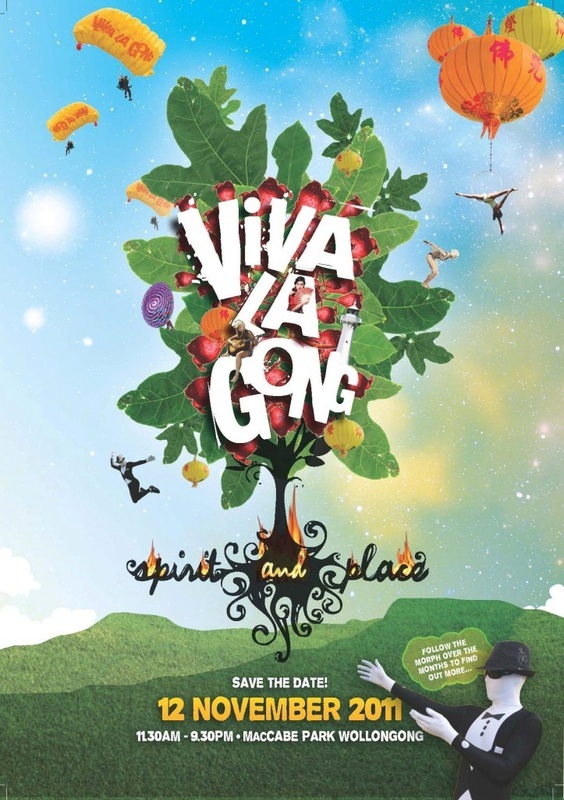 We repeated our preformance from the Viva La Gong! Festival in Sydney, at Casa Latinoamericana in the Addison Road Community Centre, Marrickville. The positive reception was exhilarating, and the café-style environment, with an enthusiastic and animated audience, was the perfect setting for the Cantata. Again, Coro Austral performed a range of separate pieces, including Guastavino's En los surcos del amor and Se equivocó la paloma, Matamoros' Juramento and Bobby Capó's crowd-pleasing Piel Canela, which quickly became a sing-along. The energy of the night was infectious and the Latinoamericana community warm and vibrant. 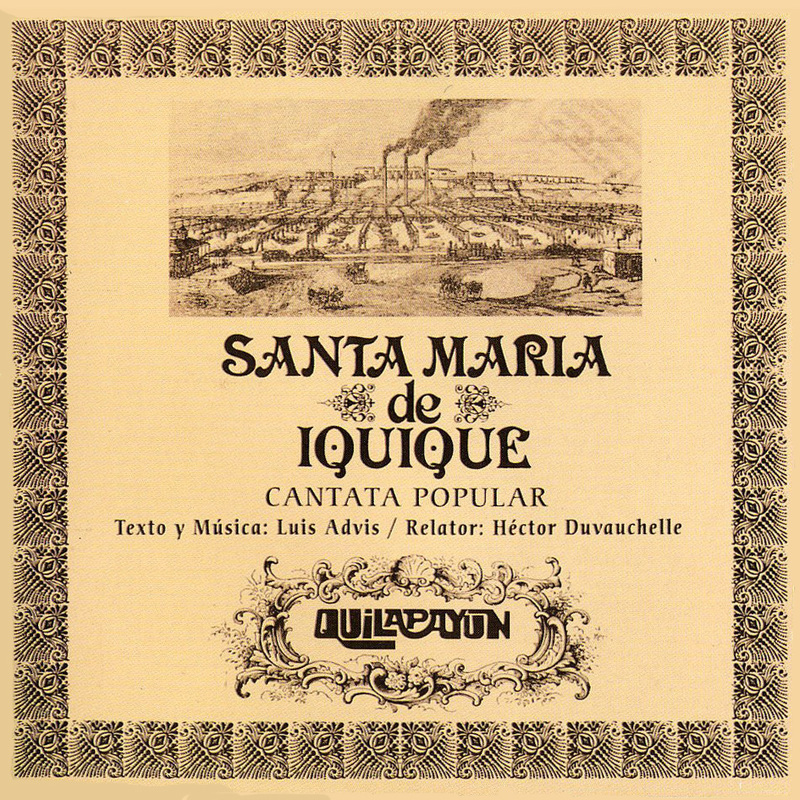 For some details on the Cantata Santa María de Iquíque, the story it tells and the history of the Cantata itself, please see the listing of our first performance of it in 2010. We revived our previous production of Luis Advis' much-loved Cantata for the 2011 Festival in Wollongong. (For notes on the story of the Cantata, please refer to our 2010 Performances page.) Again, our performance was of the full choral arrangement written by Hernan Flores and Margot McLaughlin. 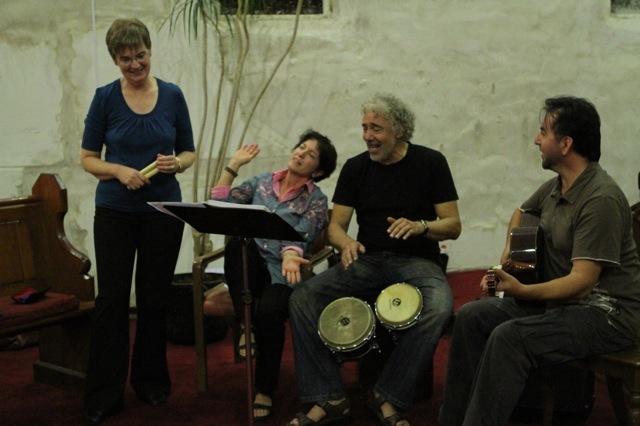 The instrumentalists were the same line-up as the previous year: Hernan Flores (lead vocals, bombo, charango), Janis Carter (vocals), Imogen Granwal (cello), Ricky Vargas (guitar) and Gaye Thomas and Greg Gibson (flutes). This year, though, the narration was in Spanish by Alex Palacio, and was displayed in English via projected surtitles. 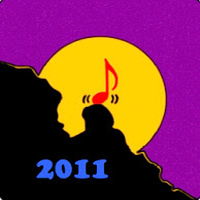 The production was opened by a bracket of songs by Trio Matiz, and a bracket by Coro Austral that included Huastavino's En los surcos del amor and Se equivocó la paloma, then Juramento and Piel Canela, and finally Bullerengue. Coro Austral visited the Moorambilla Festival, where Margot McLaughlin was giving workshops in Spanish and Latin American song. We were also to perform as part of the lunchtime concert on the Saturday. The Festival is a wonderful annual event, and we all had a great experience of being included. The response to our performance was overwhelmingly positive, which was a great experience in itself, and definitely worth the hike from Sydney to Coonamble! Our performance was fairly short, and was drawn from our performance at Blackheath just a few weeks earlier. It included Badillo's Alabanza, the anonymous De Gram Prisión, Juan del Enzina's ¡Ay Triste Que Vengo!, Carlos Guastavino's En los surcos del amor and Se equivicó la paloma, and Bobby Capó's Piel Canela. Our second gig at the Blackheath Choir Festival. This time we were in the hangover-cure Saturday morning session, sharing it with the Glenbrook Community Choir, the Illawarra Union Singers, the Jacobean Singers and Rachel’s Choirs. Our programme saw a few numbers that would stay with us for the rest of the year, and was a broader selection that would provide our repertoire for our performance at Moorambilla in the next month. It began with Pablo Fernández Badillo's Alabanza, a Puerto Rican hymn to the sacred power of nature; De Gram Prisión, an anonymous 15th Century hymn in veneration of Mary, written in a mix of Latin and early Spanish but, confusingly, with mostly Portuguese spelling; Miguel Matamoros' Juramento, a bitter promise to a failed love; Juan del Enzina's Triste España sin ventura, a funerary lament for the untimely death of Prince John of Aragon and Castille, followed by ¡Ay Triste Que Vengo!, del Enzina's comic tale of a shepherd whose every attempt to woo a village maiden goes lamentably wrong; Carlos Guastavino's two love laments En los surcos del amor and Se equivicó la paloma, and we finished with Bobby Capó's much-loved Puerto Rican bolero Piel Canela. 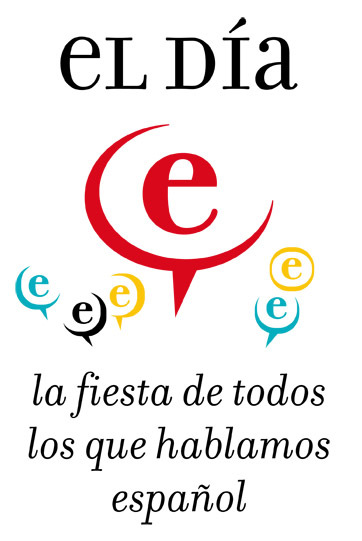 The Sydney branch of the international Instituto Cervantes holds its E Day annually — it's a festival of the Spanish language and all the cultures associated with it — and, for our first public performance of 2011, we were very happy to be part of the Instituto's E Day 2011 events. We gave a concert on the Instituto's premises at Chippendale that was literally standing room only, and saw a high level of audience response and even singing along, which always indicates how well you're being received. Our program was extensive, and involved two groupings; the first was of songs from Spain, and included Tomás Luis de Victoria's Jesu dulcis memoria, the anonymous seducer's song Pase el agoa, Alfonso the Wise's ode to the Virgin, Santa María strela do día and two anonymous hymns to Mary, the Christmas celebration Dadme albriçias hijos de Eva and the 15th Century laudatory hymn, De gram prisión. We closed the first group with two pieces by Juan del Enzina: the funeral lament Triste España sin ventura and the comic lament of a sexually-frustrated shepherd, ¡Ay triste que vengo! Our closing selection was of songs from the Americas. It included Pablo Fernández Badillo's hymn to nature, Alabanza; Bobby Capó's much-loved Puerto Rican bolero Piel Canela, and Adijo Kerida — in fact, a passionate Ladino song of bitter farewell from Sephardic Spain, but brought to modern awareness and arranged by Joshua Jacobson, director of the Zamir Chorale in Boston, USA.